Trapper Rudd has a peculiar quirk in his genetic code that certainly must be a rarity in the human specie. This genetic rarity most likely provides Trapper with the ability to think like a fish. It obviously produces some prehistoric evolutionary insight into locating fish. Trap always seems to find and hook them. Most of the Central American guides believe Trap was born with polarized vision. His innate ability to locate fish in the murky, mocha-colored water of the backcountry mangroves is legendary. Trap says: "I don't see the fish so much as I feel them". Trapper Rudd is always going to somewhere exotic in search of new places to fly fish. Putting together a trip to a place like Micronesia is no easy task and the results are always unknown. Join us to find out how a trip like this comes together from the initial concept to hooking up with new exotic species like Indo-Pacific tarpon, permit, bonefish and giant trevally. Trapper is a juggernaut of angling passion that few in our country get to witness firsthand. His propensity to fish "off the grid" and "under the radar" makes it difficult for the media to locate him long enough to get a quote or interview. Trapper has fished every continent on our planet, save Antarctica. Simply because he believes the odds are fairly low that he can get a fish to rise through a hole augured into the ice after making a 40 foot cast. However it probably won't keep him from doing it. Trapper is the only known angler to have ever fished the Imperial koi ponds of the Emperor of Japan. Upon his discovery, the Imperial Palace Guards were summoned, but he was later released with a smile and asked never to return. Trap eventually blamed the whole affair on translation difficulties and lack of sufficient bribery trinkets and alcohol for the guards. Born in California and raised in the cold rivers of Colorado, Trapper always struggled with his "inner salt". By the time we as able to travel without parental consent, Trapper was difficult to locate. The saltwater in his veins commanded allegiance. He listened. The entire planet became his backyard sandbox of angling opportunity. Cannibals, communists and tribal warlords have often embraced and welcomed Trapper into their realms for his inspection of their fishing opportunities. A typical month for Trapper might see him roaming the waters of the Zambezi River in Mozambique one week, jetting off to New Zealand for trout the next week and then literally days later prowling the flats of Micronesia searching for giant trevally. His videos on YouTube have sparked much praise from industry insiders for their "raw, humorous and edgy guerrilla style". Prompting many to comment that they felt like they were with him on the water. Others think the official diagnosis for Trapper is "piscatorial dementia". Trapper was a trout hunter throughout all his childhood. Exploring the rivers of the upper altitudes of Colorado and eventually guiding others in the 1990's. Trapper graduated from Colorado State University with degrees in Sociology, Archaeology and Anthropology. Thus explaining his affinity for foreign cultures and their local fish. Trapper was the Owner of Cutthroat Anglers in Silverthorne, Colorado from 1999 to 2010. Trap created a unique and coveted fly shop and guide service there, but eventually his wanderlust for angling exploration and his devotion to his wife and children convinced Trap to pass the legacy on to another. Trapper and his family moved to Bonita Springs, Florida where the salt hangs in the air. Flip flops are optional. Trapper is currently a partner in Sporting Life Adventure Travel. A fly fishing destination company that specializes in unique angling destinations and exceptional client relations. His savant-like ability for catching permit has earned him an enviable reputation with those who pursue these nervous crab eaters. 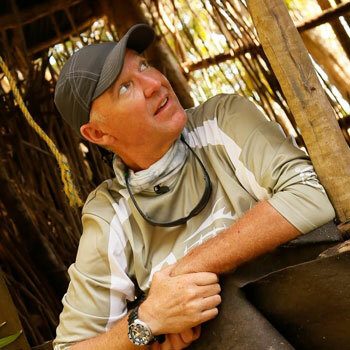 Trap won't reveal the actual number, but at least one Yucatan guide has witnessed him land more than 6 in one day. The real number must be sniffing the 200 mark. Trapper is often recruited by lodges in tropical destinations to train guides on flats fishing and explore potential frontiers for fly fishing. If Trap thinks there might be fish there, it is not uncommon for him to go "native" and disappear in the jungle. Only to emerge later with some incredible stories, video and information. Trapper has been featured on numerous television shows including "In Search of Flywater", "Legends of Rod and Reel", "Backroads with Ron and Raven" and "Eco Fishing Adventures". Trap also contributes many articles to Fly Fish America as a contributing editor. Trapper is one of the few on the G. Loomis Elite Pro Staff and also fishes for Scientific Anglers. Trap also consults and fishes for Freedom Hawk Kayaks. The easiest way to find Trapper is to contact NORAD and have them check the orbiting satellites. It is rumored he has a micro GPS unit implanted in his neck.